The two dominant rivers in Iraq are the Tigris and Euphrates. The watersheds, including their tributaries, account for 100% of the country’s surface water. These fabled rivers, which helped feed the Garden of Eden in the Book of Genesis, now provide drinking water, supply industry and irrigate massive swathes of farmland. Both the Tigris’ and Euphrates’ main stems are transboundary rivers, originating in Turkey. Before their confluence into the Shatt al-Arab, the Euphrates flows for about 1,000km and the Tigris for about 1,300km within the territory of Iraq. The fact that these important rivers do not originate within the country has been a long-standing source of tension with Iraq’s riparian neighbours, and puts Iraq in a difficult position when trying to plan for and manage its water resources. In addition to these major rivers, there are also a number of major tributaries, including the Greater Zab (which originates in Turkey); the Lesser Zab (which originates in the Islamic Republic of Iran); the Diyala (which originates in the Islamic Republic of Iran); the al-Adhaim, which drains about 13,000km2 entirely in Iraq; and the Nahr at Tib, Dewarege and Shehabi rivers, draining together more than 8,000km2. 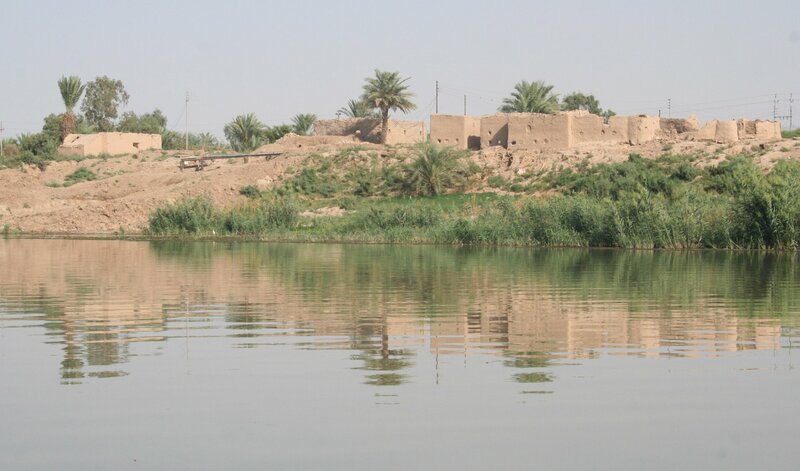 In southern Iraq, the Karkheh River, the main course of which is in the Islamic Republic of Iran, brings over 50,000km2 and flows inside the Hawr al-Hawiza marsh, which is connected downstream with the Tigris and Euphrates system. The most significant downstream tributary is the Karun River, with a catchment of about 67,000km2, which has a primary impact on the salinity intrusion along the Shatt al-Arab. The total natural run-off of the Euphrates watershed is estimated to amount to between 27.0 and 35.1 billion m3/year, while the Tigris watershed, including its tributaries, is between 41.2 and 58.3 billion m3/year. These estimates vary considerably between sources. This lack of homogeneity is due to two reasons: the scarcity of data released by qualified authorities; and the high variability of the flow recorded at gauging stations. Despite this discrepancy in the amount of natural contribution of the two rivers to Iraq, it is generally acknowledged that the amount of surface run-off has been reduced by upstream impairment to the order of 30%. This impact is forecasted to increase further in the next 20 years, reducing the water available to Iraq by up to 60%. Iraq can be divided into seven hydrogeological zones in accordance with their various physiographical, structural, geological and hydrogeological properties. These zones are shown in the map below. Iraq’s annual active groundwater recharge rate is not fully understood. The Iraqi government, in cooperation with UNESCO, is currently studying the country’s aquifers in order to more fully understand the potential of these systems. Groundwater storage is very sensitive to the consumption and availability of surface water so that any changes in withdrawal from wells can affect discharge along the river, and any changes in streamflow can affect the volume of available groundwater. Therefore, if the amount of surface flow coming into Iraq from its upstream riparian neighbours is reduced as much as forecasted, there will also be a significant impact on groundwater systems. Map 1. 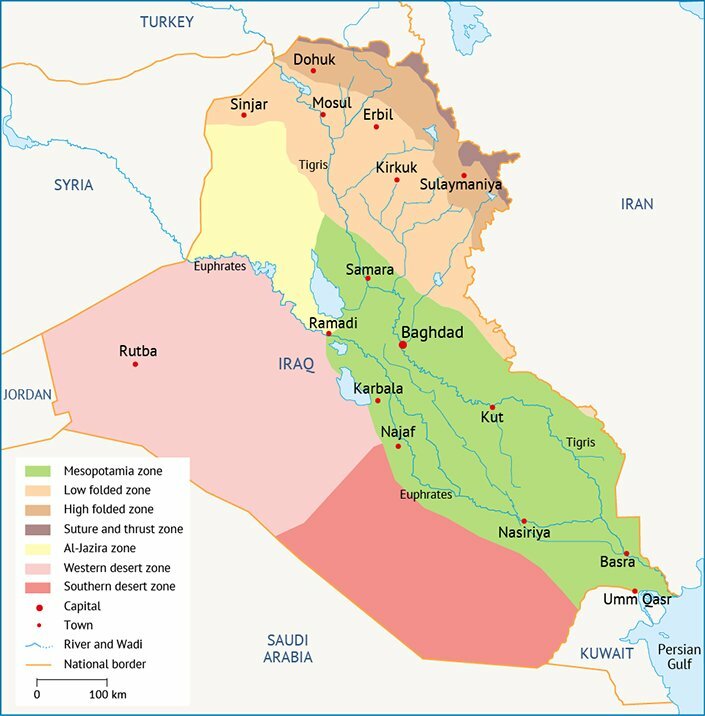 Iraq’s hydrogeological zones. There have been official announcements of a plan to build a large desalination plant in southern Iraq. The project aims to supply 400,000 people in the city of Basra with drinking water as well as supply oil fields. Completion was originally expected to be April 2017 but that may be delayed with the security concerns of IS and the current economic hardship from low oil prices. If completed, the reverse-osmosis plant will be the largest facility of its kind in Iraq, capable of supplying 199,000m3 of potable water a day. Due to the low overall irrigation efficiency in Iraq, most drainage water is returned to rivers with only a portion of it being collected and reused. The Ministry of Water Resources plans to modernize its drainage water collection system in order to better reuse irrigation water, which is critical to meeting the country’s future water needs. Among other uses, the treated water can be used for oil well re-injection, creating green belts to combat desertification and augmenting the water available for the Mesopotamian Marshlands of southern Iraq.